In the future, a vast computer network connects the globe and administers civilization’s mundane daily functions. Over time, this network begins to break down and clog with viruses. Now on the verge of catastrophic collapse, a lone pilot must drive a cyber-tank into the virtual reality of the network, clear out the attacking programs, collect the viruses stored in datapods, and deploy those pods into the heart of the corruption. 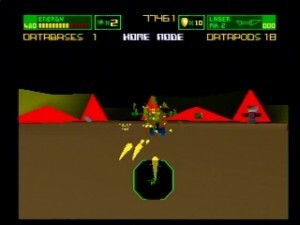 I-War takes obvious inspiration from Tron, and offers basic levels created out of sharp, shaded polygons in a style somewhat reminiscent of that film’s idea of the inner workings of your computer. Levels are broken into large, contained rooms connected by one-way teleporters. Individual rooms range from open areas packed with enemies to areas segmented by locked doors or simple traps. 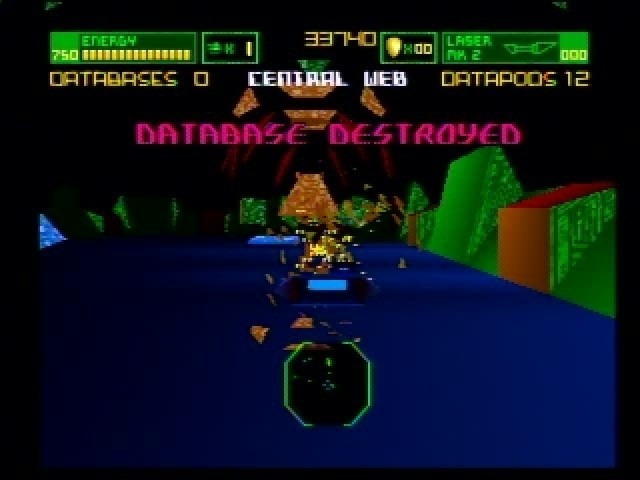 Your goal in each level is collect the required number of “datapods,” either lying around or contained within database structures you must demolish. Once all datapods are collected, an exit opens up and takes you to the next level. 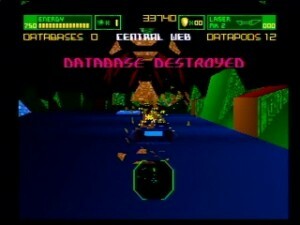 Fairly straightforward gameplay, and especially typical for the Jaguar. Graphically, the game uses its virtual setting as license to keep areas minimalist. Though textures exist, they are few – used mostly for detail on corners or structures. The floors and walls are bright pastel polys with simple Gouraud shading, which works most practically as a reference for showing your movement. There’s not much going on here visually, but it’s hard to critique, precisely because the Tron setting means there shouldn’t be much going on. The simple renderings fit the theme well. They also work to keep the framerate very playable. Though it can drop significantly (and directly related to the number of polys being displayed at one time), in most cases it seems to maintain a steady 30 FPS. Many arenas, after all enemies have been taken out, simply blaze by. 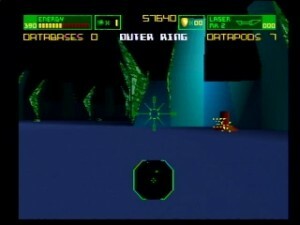 On the other side of this, fights with multiple enemies and flying polygon lasers noticeably lag. The inconsistencies are a bit of a drag, but staying in the range of “choppy, but playable” and “fastest I’ve seen a Jag game move yet” is okay in my book. But let’s not kid ourselves either – the lack of visual variety means I-War starts to get boring quickly. I’ve already talked about how I really like the inherent campiness in the 90’s conceptualization of VR, so I probably have a higher tolerance for these bland computer worlds than many others will. Even still, room designs start to get obviously reused early on, and you will never see any levels that break the core design of open areas with medium distance visibility and no sky. Despite the computer theme, there’s also no attempt at a stylized representation of being inside recognizable computer equipment. Though the level names imply that you’re moving to different mainframe hardware, individual levels don’t look different from each other or change in basic layout. Similar (or often, completely identical) rooms simply get reshuffled and populated with different objects. There are just not enough changes to make level fifteen look much different from level one, giving you fewer reasons to slug through multiple copied areas. 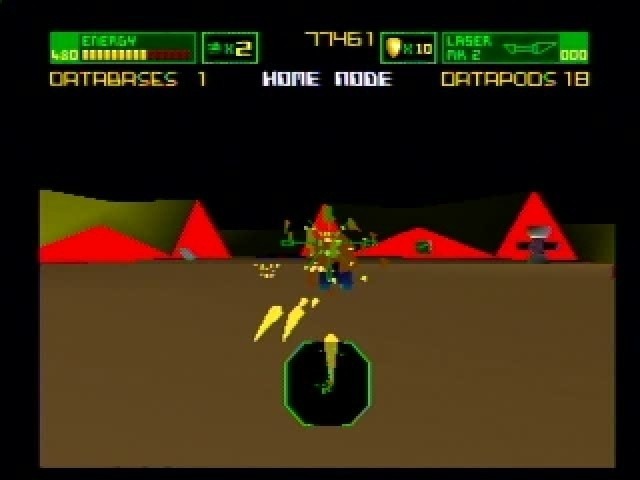 20 of the 21 levels also consist entirely of the same “find and collect the pods” gameplay as Cybermorph, though with less of a sense of free-roaming discovery. The teleporters make this a very linear affair, and only the puzzles in a few of the rooms will shake up the pod hunt. I call them “puzzles,” but they’re really more basic than that; usually relying on you to do no more than find a switch (sometimes in another room) or avoid some traps (like bumpers or spikes). I think the most complicated one I found required you to shoot a switch in another set of rooms to activate a jump boost in the floor that would sail you over some spikes – so nothing that will be too confusing or challenging. Enemy resistance is sporadic, and usually consists of guntowers or smaller mobile tanks. They can wear you down, but energy pickups that readily recharge your life, or the fact that you can freely see and hit most enemies outside of their own activation radius, mean that a little planning can make this a pretty easy game. It’s not all bad though. Again, the acceptable framerate keeps things playable. Levels are small enough that you can clear them quickly and won’t get lost for too long. It’s casual enough that it can be fun in pieces, and slogging your way to final boss won’t be too much of a chore. Your progress can also be saved to the cart between levels, meaning you can pick up your game quickly without having to worry about passwords or playing levels over again. One thing I-War does particularly right is its placement of weapons and upgrades. Blasting towers and swatting tanks quickly became routine, as there are no greater tactics beyond shooting your enemies more rapidly than they shoot you. Despite this, I still looked forward to upgrades and thought they came at exactly the right times. Just when I thought I was getting bored, here comes a twin laser upgrade to help me knife through defenders twice as fast. Or the autotargeting ability that lets you finally shoot flying drones, or track the bouncing mines. Or the plasma cannon that’s pretty effective at charging up and demolishing stationary towers. It’s a small aspect, but important. Even if hardly any other part of the game improves as you go along, your abilities at least will. An evolving weapon set keeps things somewhat fresh. Controls generally work. They’re floaty, but support the idea of piloting a hovertank. B selects one of three possible weapons, A shoots it, and C activates one unit from your limited supply of timed shields. The number pad is dominated by different view options – most of which are graphical filler, and many of which slow down the framerate – while the 7 key activates a rather useless map. It shows rooms, and how the teleport pads are connected, but I couldn’t make out if it showed anything vital. If enemies or uncollected datapods are shown on this map, their icons are too small to make out. A radar upgrade that appears on your HUD will be more useful in that department. It is worth noting that you can’t strafe, and this becomes annoying as your tank catches on walls or edges. It also subjects you to some damage you can’t easily dodge, and limiting you to forward/backward movement can make scooting by traps or lining up enemies a particular pain. Still, the game remains playable throughout. Music is what I would call “virtual techno.” It’s the same kind of beat and sets of instruments that kept popping up for these kinds of VR media, and even resemble the background music in The Lawnmower Man. It’s unobtrusive and futuristic. Sound effects are pretty average, and pretty forgettable. Lots of “pew pew” laser effects and compressed, crackly explosions. A voice synthesizer ramps up the camp factor with monotone warnings of “damage critical!” or similar status changes. I can’t decide if something so intentionally devoid of personality could be considered more annoying than Cybermorph’s Skylar. I-War is probably worth playing if you like the concept, don’t try to rush through it, and get it cheap. Its gameplay is repetitive, but uncomplicated and enjoyable, with one of the Jag’s better 3D framerates. The well-rationed tank upgrades also give a distinct sense of progress as it becomes noticeably easier for your to splinter virtual foes. There’s not much else to it though, and many gamers will get understandably bored before the halfway point. Overall, a decent game that won’t set the Jaguar, or your opinion of it, on fire. Generally fast framerate. Simple, catchy gameplay. Basic graphics and simplistic levels. Very little changes as the game goes on.